methane emissions | Are there chicken sheds in heaven? Care about climate change? Go vegan! 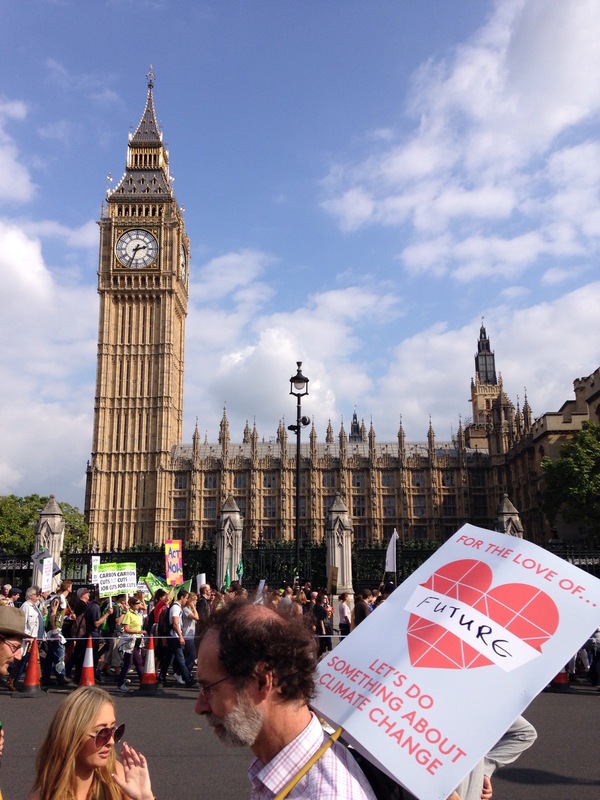 This afternoon we joined London’s march for climate action. Some 40,000 people turned out and marched along Embankment to a rally in Parliament Square. The rally comes ahead of a summit on Tuesday for 125 heads of state and government at the United Nations headquarters in New York. This meeting is the first such gathering since the unsuccessful Copenhagen conference in 2009 and will attempt to push forward political momentum towards a new universal agreement on climate to be signed by all nations at the end of 2015. Climate change is a huge part of why Ed and I became vegan in the first place. Most people associate veganism with animal welfare far more then they associate it with environmentalism but for anyone who cares about the environment then switching to a vegan diet is a really obvious choice to make. Global warming has been called humankind’s “greatest challenge” and the world’s gravest environmental threat. Many conscientious people are trying to help reduce global warming by driving more fuel-efficient cars and using energy-saving light bulbs. Although these measures help, science shows that going vegan is one of the most effective ways to fight global warming. A staggering 51 percent or more of global greenhouse-gas emissions are caused by animal agriculture, according to a report published by the Worldwatch Institute. Additionally, a recent United Nations report concluded that a global shift toward a vegan diet is extremely important in order to combat the worst effects of climate change. According to the United Nations, raising animals for food is “one of the top two or three most significant contributors to the most serious environmental problems, at every scale from local to global.” In addition, the official handbook for Live Earth, the anti–climate change concerts that Al Gore helped organize, says that not eating meat is the “single most effective thing you can do” to reduce your climate change impact. Carbon dioxide, methane, and nitrous oxide together cause the vast majority of global warming. Raising animals for food is one of the largest sources of carbon dioxide and the single largest source of both methane and nitrous-oxide emissions. Burning fossil fuels (such as oil and gasoline) releases carbon dioxide, the primary gas responsible for global warming. Producing one calorie from animal protein requires 11 times as much fossil fuel input—releasing 11 times as much carbon dioxide—as does producing a calorie from plant protein. 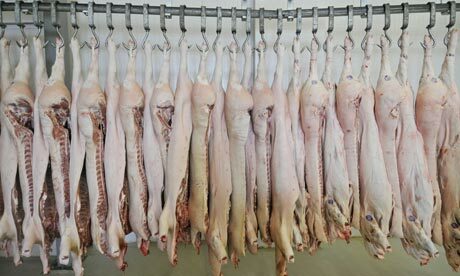 Feeding massive amounts of grain and water to farmed animals and then killing them and processing, transporting, and storing their flesh is extremely energy-intensive. In addition, enormous amounts of carbon dioxide stored in trees are released during the destruction of vast acres of forest to provide pastureland and to grow crops for farmed animals. On top of this, animal manure also releases large quantities of carbon dioxide. You could exchange your “regular” car for a hybrid Toyota Prius and, by doing so, prevent about 1 ton of carbon dioxide from entering the atmosphere each year, but according to the University of Chicago, being vegan is more effective in the fight against global warming; a vegan is responsible for the release of approximately 1.5 fewer tons of carbon dioxide into the atmosphere each year than is a meat-eater. The billions of chickens, turkeys, pigs, and cows who are crammed into factory farms each year in the U.S. produce enormous amounts of methane, both during digestion and from the acres of cesspools filled with feces that they excrete. Scientists report that every pound of methane is more than 20 times as effective as carbon dioxide is at trapping heat in our atmosphere. The EPA shows that animal agriculture is the single largest source of methane emissions in the U.S.
Nitrous oxide is about 300 times more potent as a global warming gas than carbon dioxide. According to the U.N., the meat, egg, and dairy industries account for a staggering 65 percent of worldwide nitrous oxide emissions. You Can Help Stop Global Warming! The most powerful step that we can take as individuals to avert global warming is to stop eating meat, eggs, and dairy products.